7 Myths about Tufas Bouldering Lounge - Debunked!! You won’t find any ropes here, but Tufas isn’t restricted to bouldering. The gym also has cardio equipment, weight training, training boards, classes and events. You’ll notice when you walk in that the cardio and fitness area isn’t tucked away in a back room or dark corner - this is an “open concept” gym where the weights and cardio are right across from the bouldering cave. “We’re hoping that by having it out in the open, people feel more comfortable asking questions and trying it themselves. If they see a friend following a training program, they can ask about what they’re doing,” explained Rory. Myth #3: Bouldering...and bottle shop? Not entirely untrue—“We did talk a lot about having a bottle shop. But it was like ok, let’s focus on opening the climbing gym first, and then we can talk about adding a bottle shop or having a BYOB policy,” Rory said. The large garage door (on the right of this photo towards the back) can be kept open on nice days and will have a seating area in front so climbers can hang out after their workout. It’s not happening, but “its not out of the question. Other gyms have them and have found its a system that works pretty well, but we decided it wasn’t a priority for opening day. Honestly if it’s something our members want, we’ll find a way to make it happen,” said Reiver. 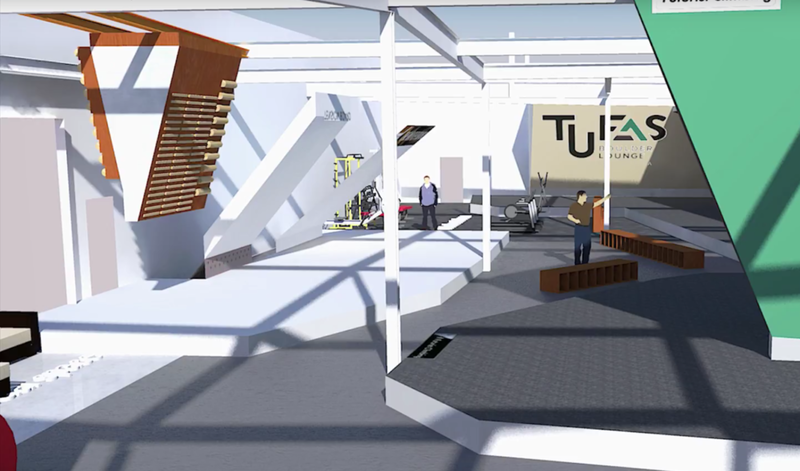 It’s been a long journey for Tufas but construction is finally wrapping up — Tufas has not set an opening date, but they have announced their “Meet the Setter's Party” which will give a sneak peak to what the gym has to offer on June 6th. To get tickets, sign up for the newsletter and find out more, go to the Tufas website.